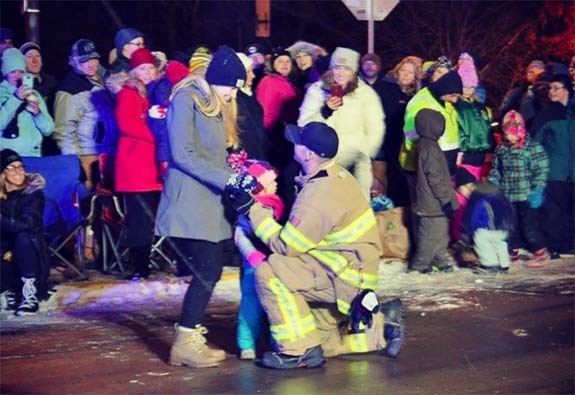 On a chilly evening in Wisconsin, Menomonie firefighter Matt Poliak halted a Christmas parade to deliver a heartwarming marriage proposal and two diamond rings — one for his girlfriend, Grace Johnson, and the other for her two-year-old daughter, Isla. Grace and Isla were watching the Winter Daze Parade from the curb last Thursday when Poliak hopped off his decked-out fire truck and stopped the procession. 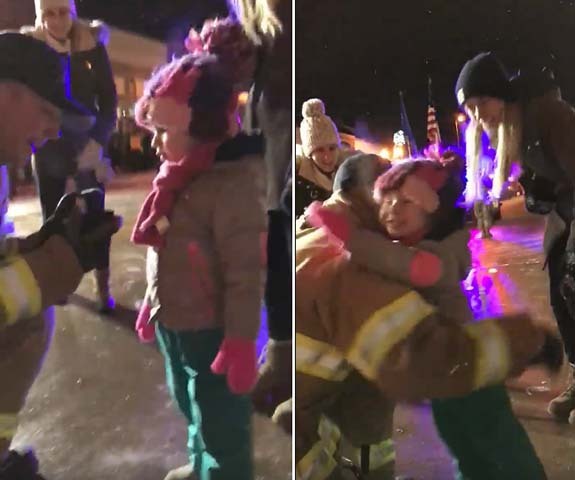 Little Isla ran out to meet the firefighter, who she's known since she was an infant. Her mom followed close behind. 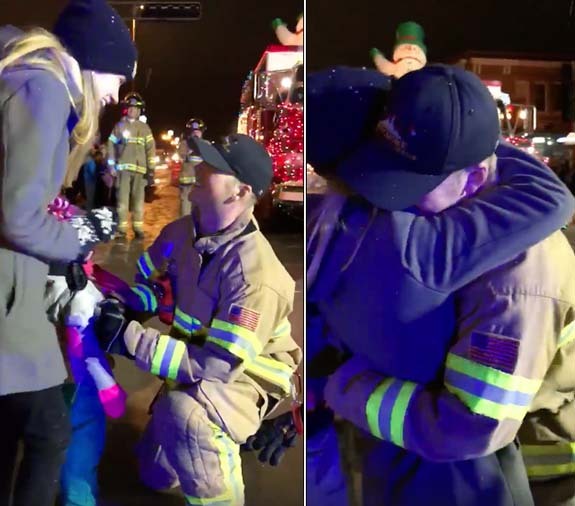 In front of the crowd, Poliak, 33, went down on one knee and asked Johnson, 24, for her hand in marriage. The young mom said "Yes," and the couple embraced to the spirited approval of those in attendance. But, Poliak was not done, yet. 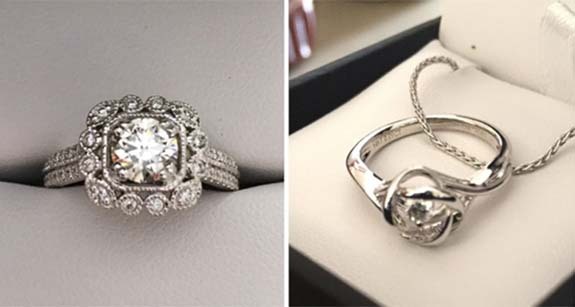 He then turned to Isla, got down on one knee again and proposed to her with a diamond ring that was strung on a necklace. The little girl nodded her approval and then jumped into Poliak's arms for a big hug. Poliak's extraordinary thoughtfulness has turned him and his new family into international celebrities. Their story was picked up by Inside Edition, the Today show, ABC, Fox News and Yahoo, among others. "I figured it would be an easy way to get all of our friends and family to be around without raising Grace’s suspicions," Poliak told InsideEdition.com. He also explained why it was important to include Isla in the parade proposal — a surprise he's been planning since October. 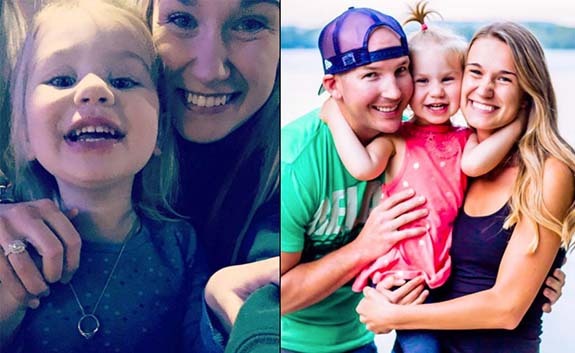 "I always knew I wanted to include Isla because she’s such an amazing little girl and it was important for her to be asked if she wanted to be part of my family," Poliak said. The couple has yet to set a wedding date, but we're sure little Isla is looking forward to walking down the aisle. Credits: Screen captures via Facebook/Liz Rensch; Crowd photo, jewelry photo and mom/daughter photo courtesy of Matt Poliak/Grace Johnson; Family shot via Facebook.com/graciej11.